I just installed WordTwit, a WordPress Plugin that utilizes Twitter’s API to automatically push a published a post to my Twitter account as a tweet. Well, it’s another way of letting friends and followers know I’ve got a brand new post. In addition, the plugin also converts links into tiny URLs. This is a great feature since we all know how long WordPress permalinks can get at times. So, here it is, the first WordPress post that is officially a tweet. If you wish to follow me in Twitter, you can follow me here. 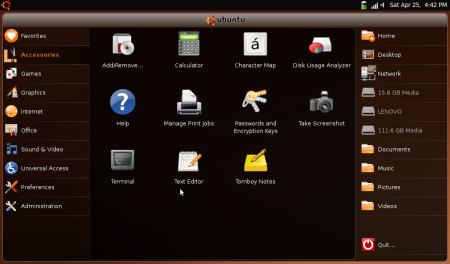 I finally had the chance to play around with Ubuntu Netbook Remix on my Lenovo S10. I went ahead and downloaded the Netbook Remix IMG file from Ubuntu’s website. I had to install the USB Imagewriter program first since it wasn’t installed by default on my Ubuntu desktop which is still running Hardy Heron. I ran Imagewriter and installed the Netbook Remix on an older USB memory stick which I was no longer using. Several minutes later, I had the Netbook Remix installed on a bootable USB stick. I plugged in the USB stick and booted my Lenovo S10. The S10 recognized that the USB was bootable and proceeded to load Ubuntu. A minute later, I had Ubuntu running on my S10.